Hot off the press! 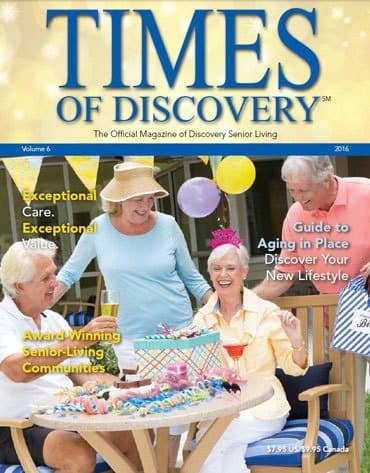 Be the first to order your FREE Times of Discovery magazine, the definitive guide to Discovery Senior Living’s award-winning communities and lifestyle offerings. Discover a world of exceptional senior living as you explore our exclusive lifestyle programs, including Sensations dining, Celebrations activities, Dimensions wellness, Connections transportation, Impressions housekeeping and Expressions concierge services. Complete the form below and your magazine will be in the mail to you tomorrow!